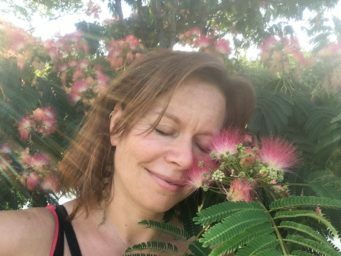 Sarah Jean brings her deep love of Plants and connection to the seasons of life into each treatment. As a child she connected deeply with the Willow, Corn, Strawberries, Chicory, and plants that grew around her. Each with its own medicine spoke to her Heart. The plants were the gateway in her path of healing and balance. In late 90s she studied Ayurveda, massage therapy, and flower essences. SarahJean received her bachelors degree with a focus in Ethnobotany of the Pacific Northwest from the Evergreen State College. Her love of plants led her to a 4 year apprenticeship in the Spirit of Plants, where her relationship with plants deepened through study of local plants, flower essences, medicine making, conscious dreamwork, and Five Element Chinese Medicine theory. She continued her studies of western herbalism at the School for Traditional Western Herbalism, in Portland. In 2013, SarahJean moved to Asheville to study Chinese Medicine at Daoist Traditions. There she learned acupuncture, Chinese herbs, Biomedicine, among other adjunct techniques. After 4 years of study, SarshJean graduated in May 2017. She continues to deepen her relationship with plants, and Chinese Medicine to bring people the best medicine to her ability. SarahJean’s practice in anchored in listening from the Heart with the desire to empower people of their paths to wellness. During an acupuncture session, the patient will be guided through an extensive intake and diagnostic process including tongue and pulse diagnosis. He or she will then receive acupuncture aimed at treating the root of the imbalance presented. Each session will take into consideration the transformation of the patient’s pattern and will be adjusted at each stage of the healing process.